Protests over Donald Trump’s presidential victory raged for a fourth day on Saturday in cities across the United States, from New York to Portland to Indianapolis to Miami to Atlanta to Birmingham, Alabama. 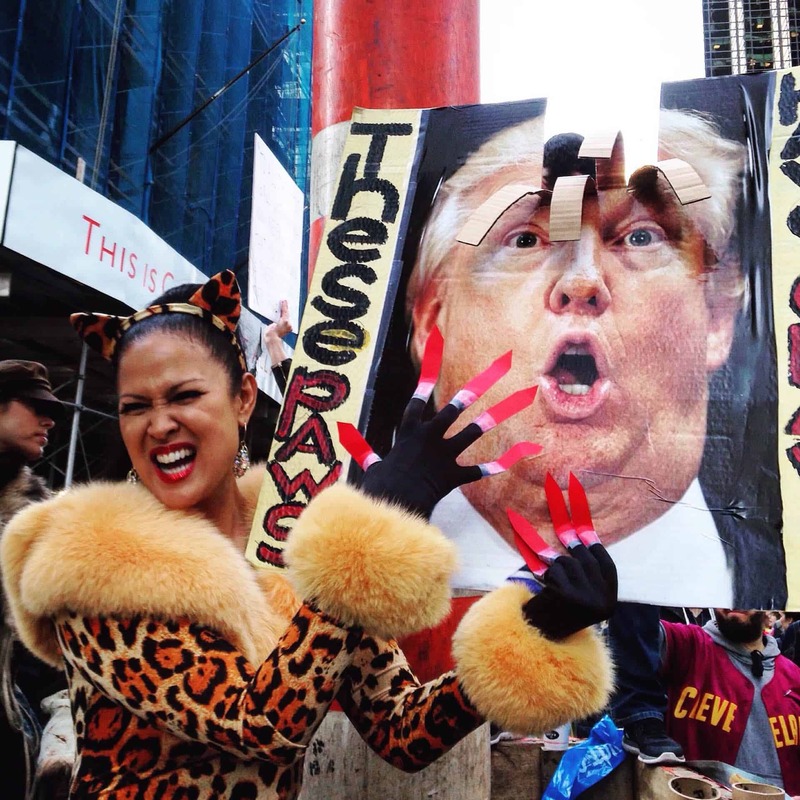 A protest in Manhattan kicked off around noon and drew thousands of people from all backgrounds and ages, chanting slogans including “We reject the president-elect,” “Build a fence around Mike Pence,” “Not my president,” and “My body, my choice.” Protesters marched up Fifth Avenue from Union Square and then congregated behind heavily policed barriers outside Trump Tower. 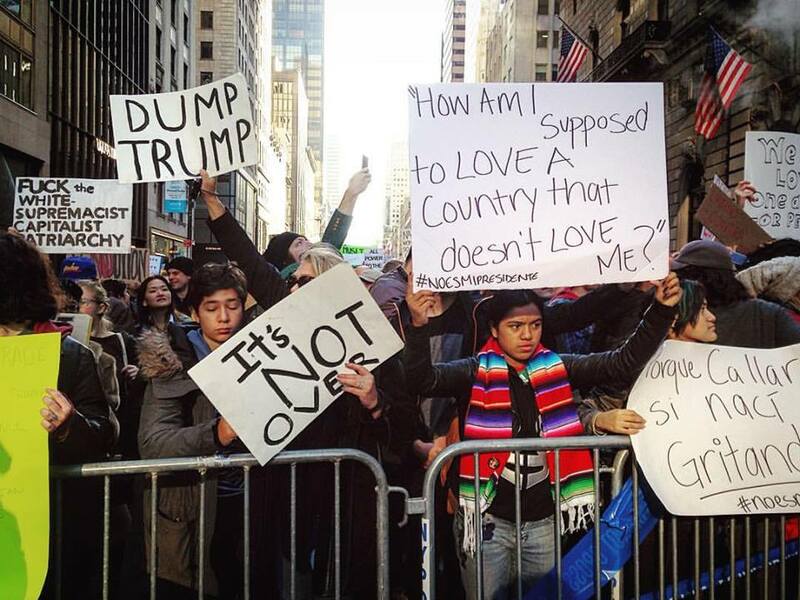 Demonstrators hold signs at a protest in Manhattan. Trump was reportedly inside the tower, joined by Brexiteer Nigel Farage, who had arrived from the United Kingdom to celebrate Trump’s victory. Security staff occasionally emerged on balconies and took selfies showing the hoard of protesters behind them. A law enforcement official told NBC News that, at its peak, the protest drew approximately 25,000 participants. An anti-Trump protester holds a sign as she marches in Manhattan. Nearly 8,000 people also spilled onto the streets of downtown Los Angeles. In Portland, demonstrations were chaotic, as they had been on previous nights. Some protesters threw bottles and other objects at police, dragged metal barricades onto train tracks, and attacked a news crew, according to Portland police. Nineteen people were reportedly arrested. The Oregonian estimated that the smaller crowd consisted of about 250 people. More protests against Trump are being planned. Some 5,000 people have said they will attend a march of “LGBTQ and Allies Against Trump” on Dec. 17 in New York City. A young woman at a march in Manhattan carries a sign showing her continued support for Hillary Clinton. And a Women’s March on Washington is set for Jan. 21, the day after Trump’s inauguration. So far, 55,000 people have said they are attending the event on Facebook. “This march is a show of solidarity to demand our safety and health in a time when our country is marginalizing us and making sexual assault an electable and forgivable norm,” the event’s Facebook description states.